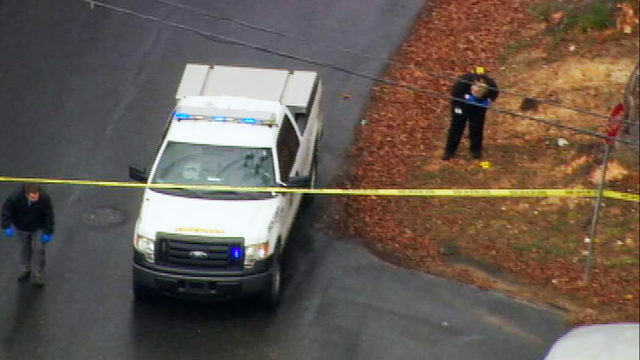 WINGATE, NC "Police are looking for an armed suspect after a man was shot dead in Wingate Monday morning while streaming live on Facebook. The authorities identified the victim as 55-year-old Prentis Robinson. Facebook Live viewers saw him stop at the Wingate Police Department to report the theft. After leaving the police department, he walks up a hill to his home on Booker Street. Robinson exchanges a few words with another man, and then there are shots. Wingate police chief Donnie Gay had no words left, noting that the deadly shooting happened moments after the man left the police station. I just talked to him, "Gay said. Robinson fell in with his face Channel 9 spoke to Charles Baker, who had known Robinson for more than 30 years, he could not believe that anyone could shoot and kill Robinson. "That's just unreal. For someone who has such a heart just to walk outdoors and kill a man, that's just nonsense, "said Baker. No shots were fired at the campus, but students, teachers, and staff fell by the wayside. Celestia Randolph recounted Channel 9 that she and other students crowded into a teacher's office while suspended. Victoria Shoaf saw police in bullet-proof gears with guns in front of her window. "I just prayed because that's just I could do something "said Shoaf. 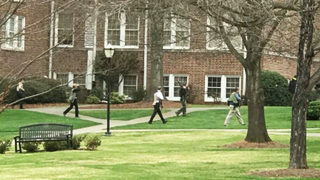 The man seen on Facebook Live was not arrested and Wingate University tweeted that the police said the suspect was armed with a long gun The authorities described him as a black man wearing a blue and black windbreaker and brown Timberland boots. Wingate police said the UK's Sheriff Office and State Bureau of Investigations are helping with the investigation. University officials were preparing counselors for students who had to talk about blocking and fear that there was an imminent danger. For more information on this evolving story, visit wsoctv.com.